We are not so patiently waiting for spring to arrive in southeastern Pennsylvania. Four nor'easters in March is just cruel and I've had enough of this cold weather. The upside is that it makes it easy to stay inside and stitch. I'm making progress on a few things, but for reasons not clear to me, I've had a hard time settling down with one project. I had the pleasure of taking two classes with Catherine Theron at the end of March. You can see the projects she taught on the Salty Yarns website by clicking on the Events tab. When I got home I was inspire to find the piece from the first class I took from Catherine at the Delaware Valley Historic Sampler Guild many (maybe 10??) years ago. This will become a Quaker sewing case. For at least the past two years, the duClay EGA chapter has hosted a stitch-a-long based on a designer. 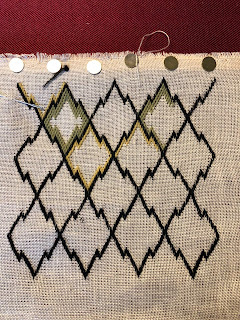 Members are free to stitch any design by the designer and it's fun to see what projects everyone is working on. This year, the chosen designer was Plum Street Samplers. 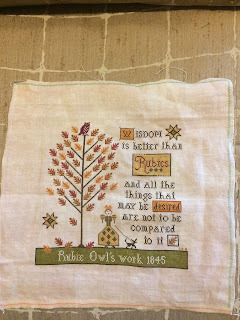 I had *several* charts to chose from, but decided on Rubie Owl's Sampler. I used DMC threads on a 36 count linen from my stash and finished it yesterday. I love the autumn colors and that little owl sitting on top of the tree. In the spirit of full disclosure, I have to say that stitching those leaves drove me a bit crazy. I ended up making a working copy of the chart and marking each leaf off as it was stitched since I found it easy to lose track of where I was. I'd love to know what's been keeping you busy! 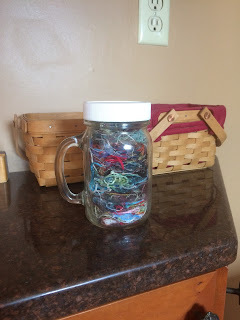 On January 1, I emptied my ort jar. It's always fun to see the layers of threads. Those blue and green threads are from Needle Delights Starstruck. The red is from a needlepoint canvas of a ladybug that I didn't quite get finished in 2017. The threads at the top are probably all from Brenda Keyes' Sampler Houses. Pictures of these projects will appear in future posts. My OMG (One Monthly Goal) in quilting is to finish New Age, a block-of-the-month quilt from 2016. I kept up with making the blocks on schedule and then didn't follow through with the setting. Here's where the project is as of this afternoon.